After all, if the ultimate goal of losing fat is to maintain a calorie deficit over time by consistently burning more calories than you consume, how could a calorie-burning tool such as cardio end up working against you? Well, just take a look around your gym for firsthand evidence. It’s all too common to see those same guys and girls who show up day after day… month after month… even year after year… and still don’t appear to have made any real progress. In many cases, despite sweating on that treadmill, stairstepper or elliptical for literally hundreds of hours combined (in combination with plenty of time in the weightroom), they actually appear to have gained even more body fat than they started out with. How is this possible? How is it possible that someone could put so much effort into their training program and actually end up travelling farther away from their goals rather than closer to them? Simple: although the act of performing cardio does burn calories in the short term, it also stimulates your appetite as well. When you combine this with the fact that the majority of people aiming to lose fat do NOT track their daily calorie intake with any real accuracy (they simply wing their diet and “eat healthy” throughout the day), and you end up with a real potential problem. For example, let’s say you performed an hour of cardio 5 days a week, burning 400 calories per session and 2000 calories per week. 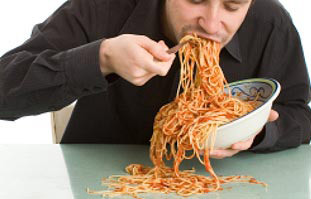 That’s all fine and good, but what happens if the appetite-stimulating effect of those same 5 sessions caused you to unknowingly consume, for example, an extra 350 calories per day? By the end of the week, you’d have burned 2000 calories from your cardio sessions, but would have also consumed an additional 2450 calories, for a net gain of 450 calories per week. Trust me, this can happen much more easily than you think. Small dietary choices that you make throughout the day add up very quickly, and 350 calories really isn’t much. If you’re constantly feeling hungry and you aren’t keeping track of your daily calorie intake, there’s an almost certain chance you’ll over-eat. Cardio is not the only culprit here either; weight training or any other form of exercise will also have appetite-stimulating effects as well. 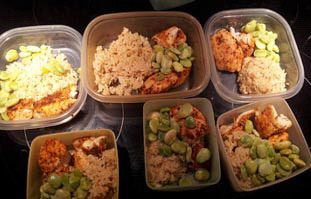 And the simple reality is this: it absolutely does not matter how “healthy” your diet is or whether you’re eating nothing but plain chicken breast, oatmeal and broccoli all day long… if the total number of calories you consume is equal to or greater than the total number of calories that you burn, you are NOT going to lose an ounce of fat, period. This is known as “the law of energy balance”, and there’s no way around it. In order to lose fat, you must maintain a calorie deficit over time by burning more calories than you consume. Plain and simple. The key is in finding a proper balance between your training program and your diet that allows you to remain in a calorie deficit throughout the week without causing you to feel excessively hungry. 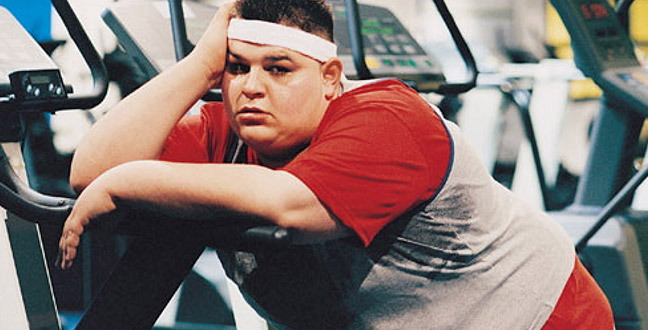 First off, stop over-emphasizing cardio and treating it as the be-all-end-all of fat loss. Cardio is simply one tool in your arsenal to help you burn additional calories, and most people way over-value it. As long as your diet is properly structured, 3-4 cardio sessions per week is easily going to be enough for the vast majority of trainees, and some will do just fine with even less than this. 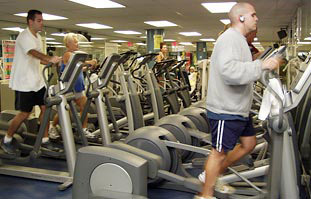 Secondly, include some high intensity interval-based cardio as part of your overall plan. High intensity interval training sessions (or “H.I.I.T” for short) in the range of 8-20 minutes do not stimulate your appetite to the same degree that traditional slow pace cardio does (in some cases it may even blunt your appetite), and while burning more total calories at the same time. However, because this type of cardio is more stressful to your body as a whole, you can only perform so much before you start getting burned out. Aim to perform a balanced mix between these two types of cardio throughout the week. For example, 1-2 aerobic sessions lasting 45-60 minutes and 1-2 H.I.I.T sessions would be a good approach. Third, start tracking your total calorie intake in more detail. This is by far the most important step of all. If you’re just eating “on the fly” throughout the day and don’t have a reasonable idea of how many calories you’re consuming in total, your overall progress will definitely be compromised or even eliminated altogether. Once you have these 3 steps in place, you can simply test and tweak from there to see what works best for you in terms of maintaining your calorie deficit while managing your overall hunger levels. Some people prefer to create a larger calorie deficit through their diet by reducing their overall food intake and scaling back on the cardio, while others prefer to consume more food throughout the day and burn more of their calories using exercise.